For this card, I stamped in black and embossed. Then, I carefully watercolored the flowers and butterflies. When that was dry, I lightly watercolored the sky. I was really happy with it, until I thought, “Oh, let me wipe of the embossed areas, just in case there is some color still sitting on top of the embossing – I don’t want the recipient to get painted fingers.” Now there are several smudges. My final touch was splatterings of clear Wink Of Stella. So, helpful readers, how should I remove the residual paint color that sits on top of embossed areas? I know I rubbed – I should not have done that. Would just blotting work? Supplies: Stamps – Hero Arts, Waffle Flower, paper – Neenah Classic Crest Solar White, Poptone Sour Apple, Strathmore Bristol, inks – VersaFine Onyx Black, Smokey Gray, ZIG Clean Color Real Brush Pens Carmine Red (022), Cobalt Blue (031), Light Green (041), Orange (070), Yellow (050), ZIG Wink of Stella, embossing powder – Filigree Fine Art Powder clear, Ranger Silver Pearl. 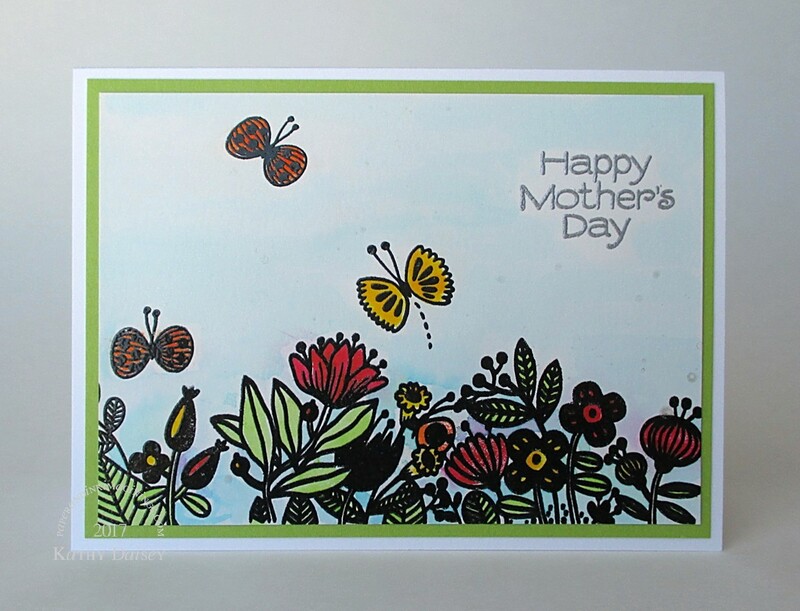 Categories: card, Mother's Day | Tags: Bristol, card, Hero Arts, Neenah, Poptone, Ranger, Strathmore, Tsukineko, VersaFine, Waffle Flower, Wink of Stella, ZIG | Permalink. I can’t help as I steer clear of watercolours. But if it was me I would probably try blotting gently with a thick roll of kitchen paper The good news is I can’t see any smudges.on your lovely card! I know that my mistakes are glaring to me, not so much to others. And the smudges are NOT huge. I will have to be more gentle next time!